More and more companies are now taking action with more than a third of the organizations applying AI at scale. Place AI at the heart of your digital activities, that is the most important message. After decades of too much promise from technology, we now see a breakthrough in the realization of concrete business value. A new AI focus is essential because your competitors will certainly use the learning acceleration offered by AI’s specific capabilities to gain a head start. 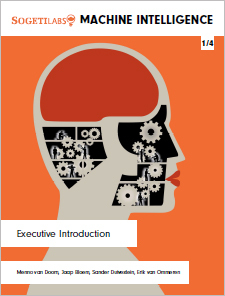 The last in a series of four qualitative research reports on the topic of Machine Intelligence, ‘AI First: Learning from the machine’ states that profit and economic growth go hand in hand with the proactive deployment of AI. It further asserts that companies can raise their Corporate IQ by embarking on a new journey of discovery built on intelligent machines. 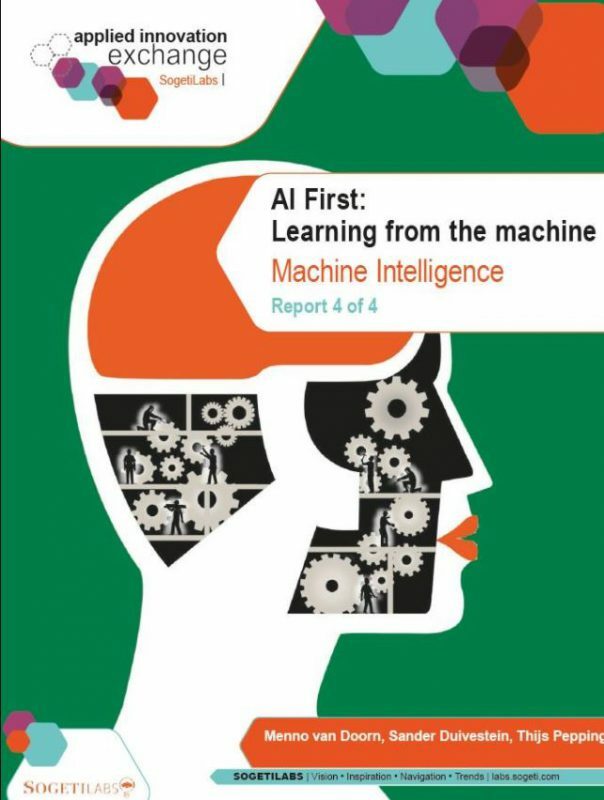 ‘AI First: Learning from the machine’ explores the latest developments on the journey to being an AI-first organization and recommends a number of actions for improving Corporate IQ with a better understanding of the relationship between man and machine. The book by Mary Shelley "Frankenstein, or the modern Prometheus" has inspired many Hollywood scenarios. The fear that is addressed in the book can also be triggered when people are confronted with applications of artificial intelligence. The anatomy of this fear for the artificial, our digital look-alikes, is the starting point for this report. The four FrankensteinFactors we describe provide insight into the underlying question where this fear comes from. The uncanny feeling that robots and automata can raise has been explained by psychoanalysts. Classical psychiatry (such as Sigmund Freud and Ernst Jentsch) and the more modern existential variant (such as Irvin Yalom) both shine an interesting light here. Emotions are explosive material, they should not be ignored. 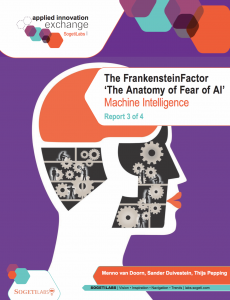 Organizations aware of the FrankensteinFactors increase the likelihood of AI success. Advise from the report: Start the dialogue with the environment (customers and employees), full transparency concerning the functioning of AI-algorithms and make human values central to the AI plans. A recent European resolution and guidelines drawn up by science and industry (Asilomar principles) provide the concrete tools for dealing with this. The report outlines the state of affairs in the current debate on superintelligence (and superstupidity) and unfolds cultural and psychological relationships that explain the fear of AI. During the F8 developers’ congress on 12 April 2016, Mark Zuckerberg, CEO of Facebook, disclosed that he was routinely using ‘bots’ – smart software applications – on Facebook Messenger. According to Zuckerberg Messenger is now sizeable enough to embed it in a new ecosystem. Apart from friends and family, we can now also use this platform to have conversations with artificial ‘friends’. 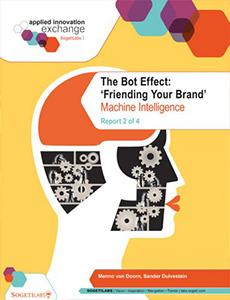 These so-called friends are services that are being offered by businesses in particular.Many people may still find it difficult to conceptualize ‘brand as a friend’, but the underlying idea is perfectly clear: Facebook aims to reap the fruits of the popularity of messaging by allowing bots to be implemented on the platform. The idea that bots are going to play a major role on messenger platforms in everyday life, is central in this report. Although it is still difficult at this stage to gain a comprehensive view of the impact, it is perfectly clear that we are talking about a fundamental shift in the way organizations and customers will conduct their business. After Mobile, Big Data and the Internet of Things, Machine Intelligence (MI) is The Next Big Thing. Machine Intelligence is the accelerator of these predecessors. With an impending breakthrough of Machine Intelligence, the interesting question is what change that will bring. In a series of reports on MI, Sogeti’s trend watchers explore the potential impact, starting with a first report giving an executive introduction to Machine Intelligence, followed by three additional reports. Healthcare, industry, agriculture, advertising companies, security, so basically any sector, can all benefit from the MI framework and this will lead to serious “rethinking”. How did we use to do this in the past, and what is possible today? How will computers be able to assist – or even outpace, as you please – humans even more in the coming years? In our series of reports we dive into all these topics.